How to turn on/off "secondary shift characters" lock?? Thread: How to turn on/off "secondary shift characters" lock?? Alright, so I just got a couple of new computers (a desktop--Gateway--and a laptop--Acer), because my old ones were stolen in a house robbery. Anyways, my desktop computer has Windows Vista on it, whereas the laptop has Windows 7 on it. My problem is that, somehow, the "secondary shift characters" are turning on, staying on for a while, and then turning off (it can be a long while--as in hours). I have the feeling I'm doing/pressing something to make this happen but maybe it's just a glitch (it's happening on both the laptop and the desktop, pretty much everytime I'm on them, so I have my doubts it's a glitch). Basically, when I hold SHIFT and press a button, a different character will come up than ''normally would.'' So, for example, SHIFT + 6 will yield a ?, instead of the ^, SHIFT + ' will give ` instead of ", and SHIFT + / will give É instead of ? -- all of the "other characters" that are shown on these ''newer'' keyboards. This is starting to become infuriating, as it seems to be a result of something I'm pressing (but I can't figure out what), and when it does I have to either figure out where the appropriate characters are, or use the character map (which is starting to eat up time). Gateway support told me to do a power drain (because, to their knowledge, there is no "secondary shift key" option). Honestly, I'm getting sick of Gateway support so I was just wondering if anyone on here has had this happen/knows how to turn this lock on/off. Or should I be listening to Gateway support and do the power drain? This may be happening due to the change of Keyboard layout. check whether it is set to English-US. 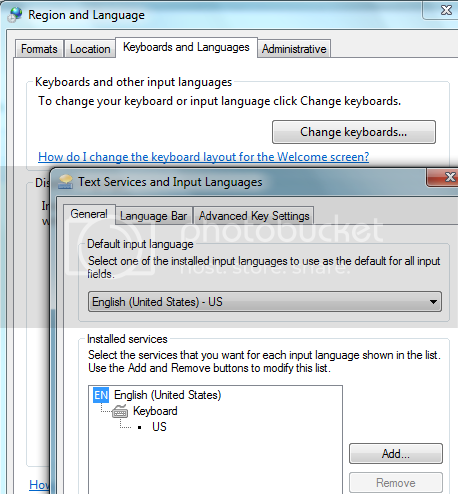 To check this, go to Control Panel then select Region and Language settings. Then check the keyboard settings. [LIST][*]To check this, go to Control Panel then select Region and Language settings. [*]Then check the keyboard settings. Yes, the keyboard layout is set to English-US. Try holding both shift keys and then hit ALT. i cannot just type. i have to hit fn as a shift key to get any keys on the right side of my keyboard. they are blue secondary keys. its on locked and i dont know how to turn it off.